Some days it seems like the only job of a parent is to say “no, don’t, or you need to listen.” We are charged with keeping our children safe and teaching them how to be happy healthy members of their communities, yet it seems that children of any age find more ways to travel the wrong path than the right one. None of us wants to be a drill sergeant barking at our children all day, but if we do nothing but wait to praise the right behavior we are not likely to succeed in keeping our children safe. Not only that, but nothing-but-praise won’t work any better than nothing-but-nagging. And while I know there are experts who have devised ratios of words of praise for each correction, a mixture of the two is also insufficient. The problem is that nagging and praise are two branches of the same tree. They are both law because they let your child know how they have measured up to your standards. Children need more than law; they need grace, too. Grace is what we do for our children simply because we loved them. We can’t show the same Grace that our Heavenly Father expresses, but grace needs to be part of our discipline equation. This chart gives great examples of connecting words that provide a blend of law and grace. These comments not only show a child what is expected, or what behavior needs to be changed, they also express love in a way that encourages children to think about the behavior and to learn why it happens. Most importantly these connecting words remind children that their parents stand ready to help them make a change. We can’t always use connecting words. 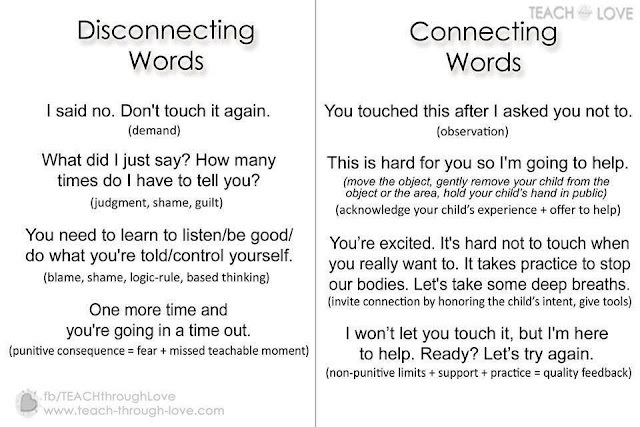 Some situations simply call for a loud, quick “NO!” However, whenever we can use these phrases we will give our children so much more than a simple direction.